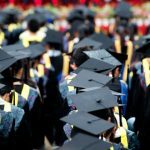 In 1992, college graduates were 26% of the labor force, those with some college or a technical degree comprised 25%, high school dropouts were 13%, and high school graduates were a whopping 36%. Today, college graduates are 41% and rising, and are the only group that has significantly grown! Those with some college are up marginally to 27%, high school dropouts are 7%, and high school graduates comprise 25%.